You are invited to the 2nd Quarter District Conference scheduled for February 25-26, 2011 in Moose Jaw, Saskatchewan. Enjoy the hospitality of the Friendly City Optimist Club of Moose Jaw and take the opportunity to meet with the District Team led by our Governor, Tim Bell. Hotel: Heritage Inn, 1590 Main Street N., Moose Jaw, Saskatchewan, Canada. Call (306) 693-7550 or 1-888-888-4374 for reservations. Both a "Kids" and a "Companions" Program will be available so you can bring the entire family. The theme is "Mardi Gras" so get your costumes ready. Just complete a Registration Form and book your room before they are all reserved! 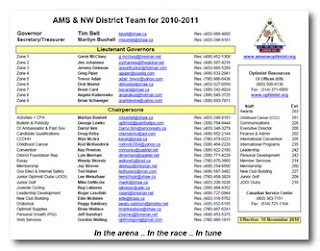 The District Contact Cards have been revised effective November 10, 2010 to reflect changes in names, email addresses and phone numbers. Tim's Governor Pin has also been used on all the cards. Click the above link for a fun little video. Immediate Past OI President Mark Shriver extends greetings to the members of the Edmonton Dinner Optimist Club on their 85th Anniversary. Formed in 1925, the Edmonton Dinner Optimist Club is the second oldest club in Canada and continues the multi generational tradition of bring out the best in kids in the Edmonton region. Hi everyone, the Optimist Clubs of Regina would appreciate your help. all you have to do is go to www.refreshEverything.ca/communityatplay. Log in and vote once a day, tell all your friends, help us build a park. We thank you all in advance, without everyone's votes, this can't happen. vote once every day!